You can make more plants from cuttings (plant propagation methods). The first step is to take cuttings (how to take cuttings). Once you have taken the cuttings for propagation, it is important to plant them properly, otherwise they will not root and clone. Fill the pot with the soil as mentioned above and water well. Mix the soil and water again and leave aside for an hour. Put the lower part (basal end) of the cutting into the rooting hormone powder and shake off the extra powder. You can use the commercial hormone or a natural rooting hormone. Make a hole in the pot up to 1 inch above the base and gently insert the cutting into it so that at least 2 nodes are in the soil. Do not push the stem in the soil to avoid any damage to the cutting. Do not water again. The stem will lose moisture through leaves via evaporation, and as there are no roots to replace the lost water in the stems, they need to retain moisture inside them. 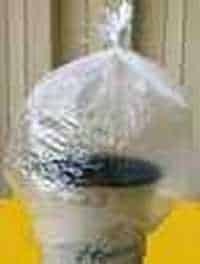 For this put the pot in a polythene bag and tie the top end or cover the pot with a clear plastic bottle (Coke bottle whose base has been removed) and place it in shade. The polyethylene lets in needed light and keeps the humidity high around the cuttings. This way the cutting will be under high humid environment at all the times. You can construct a humidity chamber using a box, pot or tray placed in a polyethylene tent in which the cuttings are placed. Some leafy herbaceous and softwood cuttings are difficult to propagate unless the intermittent spray of a very fine mist of water over the cuttings to decrease both water loss and heat build-up. Many commercial growers use an automatic mist system. Set the cuttings in a bright, warm location but away from direct sunlight. Avoid direct sun, otherwise the cuttings will overheat. After a few days, you will notice water condensing on the inside of the bag. Each week, untie the pot and watch the progress and to give fresh air to the cuttings. Add a little water if necessary. Ensure that water does not condense on the plant and the leaves not wilting, if this happens then open the bag for some time. First you will notice that one or two buds swell and shoot formation occurs. Don't just remove the bag at this stage. The cuttings will not grow after this until they begin to root. Strict hygiene practices will ensure the success of your cuttings. For this working place, pots and tools should be washed thoroughly in water with detergent or sterilized with a dilute solution of methylated spirits or bleach. How To Know if The Cuttings Have Rooted? After a few days, you will notice new leaves growing. You can test for roots by gently rocking the cutting. If you feel no resistance, then the roots have probably not yet developed. When the propagated stem cuttings have developed a few sets of cuttings, carefully take out the cuttings and separate them out. You can then re-pot them in pots or ground with rich free-draining soil.